Two Human Rights Clinic students, Geoffrey Louden and Lauren Geraghty, recently traveled to Haiti to conduct field research on conditions facing Haitians who have been deported from the United States. The students traveled under the supervision of HRC Practitioner-in-Residence Kelleen Corrigan and Immigration Clinic Practitioner-in-Residence, Romy Lerner. The fact-finding trip was part of an ongoing collaboration between the Human Rights and Immigration Clinics and other partners. The four-year old joint project has focused on documentation and advocacy with U.S. officials to stop the deportations to post-earthquake Haiti. The clinics published a report in February 2015 to allow the issue to reach a wider audience. 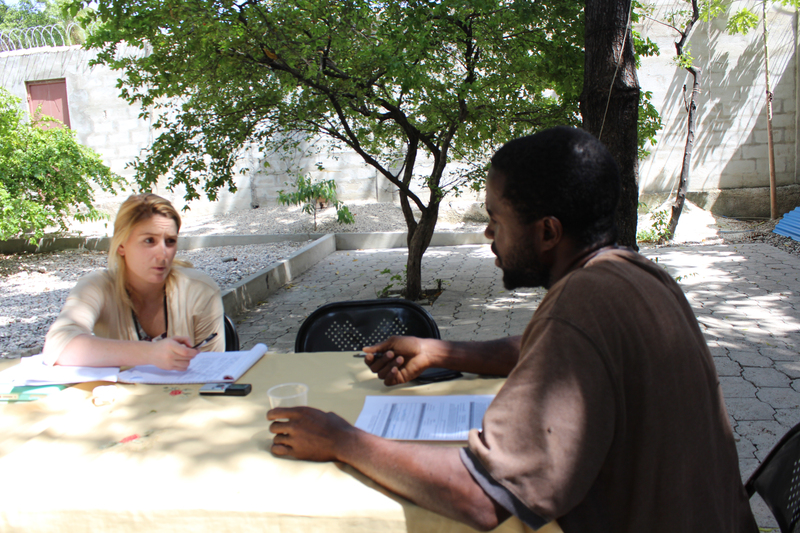 The students spent several days in Port-au-Prince where they conducted interviews with deportees, met with Haitian officials and civil society representatives, gathered documentation, and witnessed firsthand the situation facing criminal deportees upon return to Haiti – including for those individuals confined in mental health facilities. The clinics first became involved in the post-earthquake deportations issue in late 2010. At that time, the U.S. was readying plans to deport people to Haiti less than a year after the devastating earthquake of January 2010, and in the midst of a cholera outbreak. The clinics and other advocacy organizations warned U.S. officials of the potentially catastrophic consequences of deporting Haitians to this dire post-earthquake environment. Nevertheless, the U.S. commenced the forced returns on January 20, 2011. Tragically, a deportee on the first flight died of cholera-like symptoms just over a week after being deported and detained in squalid conditions in Haiti. In light of the deportee death and continued advocacy by the clinics and others, the U.S. issued a new policy on April 1, 2011 that called for a “balancing test” to weigh the equities of Haitians before they would be deported. However, with no transparency, oversight, or appeals process, the policy has not been fully effective. As a result, the U.S. has continued to deport Haitians with relatively minor criminal convictions and those with significant U.S. ties and/or suffering from severe physical and mental health problems. The clinics have also utilized the processes of the Inter-American Commission of Human Rights (IACHR) to shed light on the human rights violations inherent in the deportations. Litigation before the IACHR remains pending.